Week two of North Ridge’s series “At The Movies” took a look at another blockbuster hit, The Blind Side. We compared that true story to a similar one found in Luke 10, the story of the good Samaritan. Though separated by two thousand years, the story lines are very similar. Both involve an individual who is rejected by society at large, brushed passed without any notice. Also present in both is one person who takes notice of the outcast and cares enough to take action. Matthew 6:19-20 encourages the Christian to “store up treasures in Heaven”. This is analogy of storing up treasures is an encouragement to serve others, good deeds on earth create treasures in heaven. We must be careful to hold Luke 13:30 in as high regard, “those who are last will be first and those who are first will be last.” (Jesus, speaking of Heaven). The motivations for our actions, good and bad, matter significantly to God. A man who serves in order to be seen by his peers will not receive the same reward in heaven as one who sacrifices for others in silence. As the message progressed, ways to present the conflict of motivations in a single image churned in my mind. Greek mythology provided the insipiration for the subject of my drawing; the story of Daedalus and Icarus from Metamorphoses by the Roman poet Ovid. In the myth, Daedalus and his son Icarus have been exiled to the island of Crete by King Minos. While on the island, Daedalus constructed two pairs of wings using wax and feathers that he and Icarus could use to escape the island. Daedalus warned Icarus not to fly too close to the sun nor too close to the sea. Despite his father’s warning, Icarus became overcome with the thrill of flying. As he soared higher, the wax began to melt and release the feathers that enabled Icarus to fly. Soon realizing he had no feathers left, Icarus fell into the Icarian Sea (named for Icarus). I have drawn the fallen Icarus to represent individuals who attempt to pave their own path to God with their deeds. Though they are serving others, their motivations are selfish. Instead of serving out of compassion for an individual, they are merely using individuals as opportunities to promote their own perceived “goodness”. Despite their best efforts, their facade of empty kindness will collapse when their true character is exposed and, like Icarus, their mistake will not come without consequences. Juxtaposed to the Icarus figure is a scene of the crucifixion. 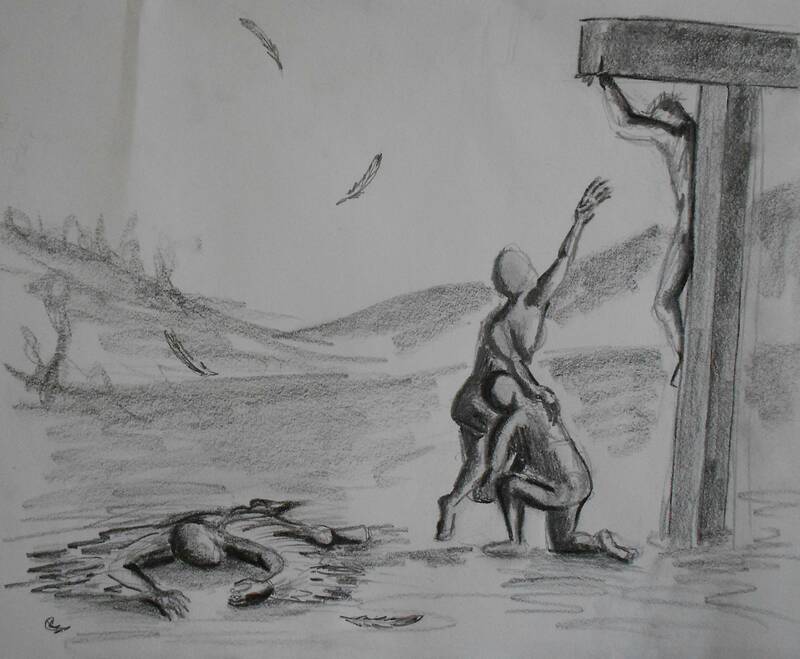 Jesus is hanging on the cross, while two figures on the ground work together to reach him. This cooperation is what God desires of us. It is in helping others grow closer to God that we, ourselves, are able to grow closer to Him. The kneeling figure is providing a step up for the other figure to reach for their Savior, making himself last. We each must move over, giving everyone else priority over ourselves, in order to be genuinely good and honestly compassionate. What I really took away from today’s message was this; what’s your motivation for helping people? Are you genuinely compassionate and willing to move over for anyone (unconditionally) or spiritually greedy and attempting to hoard heavenly treasures (an idea that will bite you in the end)?